Spend more time enjoying the beach instead of fooling with the hassle of lugging down your own beach chairs. Renting beach chair sets is the most convenient and relaxing way to enjoy your beach time. Book Your Beach Chairs Now! Spectrum Resorts guests may charge beach chair set rentals to their room. We require notice of cancellation by 4 p.m. the day prior to the first day of your rental to receive a full refund. If your reservation is canceled after 4 p.m. the day prior to the first day of your rental, you will forfeit 100% of your beach rental. Refunds will only be given for days when the beach cannot be setup or is closed. All rates and policies are based on availability and subject to change. Rates are subject to applicable taxes. Location of beach chair sets are subject to availability and may change at any time without notice. The use of personal beach equipment (including chairs, umbrellas, etc.) is allowed, but they must not be placed in front of Spectrum Resorts beach sets. Personal beach equipment may be placed in the designated open areas or behind beach chair set rentals or south of the adjacent Beach Club West property. Personal beach equipment may not be left overnight. Are beach chairs included in my base-rate? Beach Chairs are not included in the rate, however they can be purchased at a discounted rate for all Spectrum guest. Do beach chair rentals take credit/debit on the beach? Beach chair rentals can be paid with debit cards, credit cards or cash. Guests of Spectrum Reorts also have the option to charge beach chairs to their room for payment upon checkout. What time of year are beach chairs available? First Sunday in March until October 31st. Can you reserve an area on the beach? 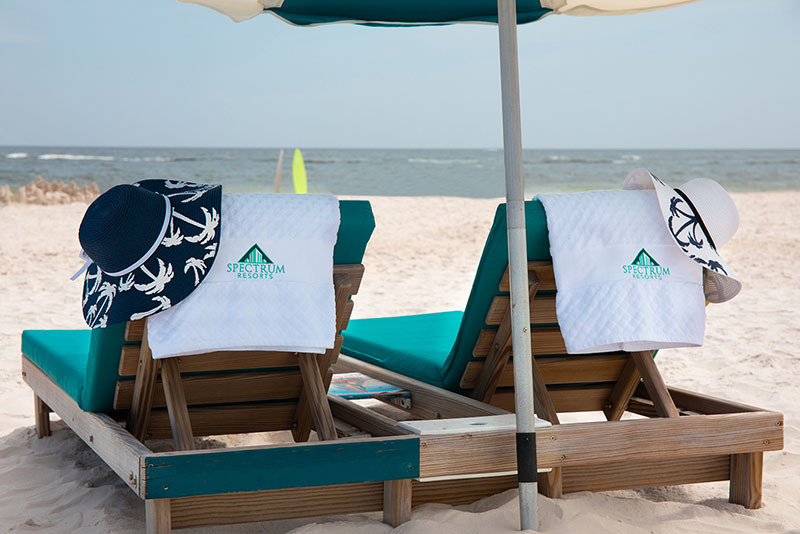 Areas of the beach cannot be reserved, with the exception of Spectrum-managed beach chair rentals available to all guests staying at The Beach Club.